Book Review of "The Family Tree Guide to DNA Testing and Genetic Genealogy"
This is a great reference book for anyone who is interested in DNA testing. It covers both the basics and the advanced information about not only the DNA test itself but also the companies that do the testing. It contains many colorful diagrams and well written definitions that explain key DNA terms and concepts. Also, it provides tips for selecting the DNA test that can best help you solve your family mysteries, with case studies showing how each test can be useful to genealogical research. Since all chapters won't apply to the DNA test you have taken I suggest you skip to the end of the less applicable chapters and just read the core concepts summary. This is such a comprehensive book that I have only briefly summarized some of the chapters. This chapter discusses some historical facts about DNA testing. It also gives basic definitions and descriptions of the four types of DNA tests. One of the biggest misconceptions is that the results of a DNA test will reveal your family tree. Sorry, discovering your family tree still means traditional genealogical research methods. In other words,"A DNA test alone does not provide a family tree" "A DNA test does not reveal your health information." Watch out for The Core Concepts "Common Misconceptions" for this chapter. They are a little confusing. I couldn't tell if the "Core Concept" statements being made were supposed to represent true concepts or the opposite. I needed to reread the chapter to gain a better understanding of the statements in the "Core Concepts" paragraph. 3. Ethics and Genetic Genealogy - 12 standards to consider following. 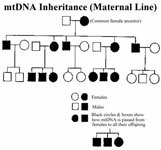 This chapter presented some considerations with regard to genetic genealogy which were very thought provoking. For instance, what do you do about the possibility of revealing a long forgotten or hidden family secret. Part Two. Selecting a Test. Part 2 is fairly technical in its presentation which can be a road block for some readers. However the author presents a fairly understandable summary section at the end of each chapter which gives the core concepts. Each chapter describes a different type of DNA testing, its uses, and limitations. I have only provided a couple of interesting quotes from each section to give you some ideas about what you may learn. "It is difficult to pin point how closely related two individuals with mtDNA matches are. Because mtDNA changes relatively slowly, individuals with identical mtDNA can be related either very recently or as much as several thousand years ago." "It is not as useful for finding random genetic cousins in a testing company's database. It is only useful for finding whether or not two people are maternally related." Bettinger begins the chapter with an explanation of what autosomal-DNA is and then proceeds to explain how the test works and how to use it to identify potential genetic cousins. Here is where Bettinger mentions three of the DNA testing companies FamilyTreeDNA, 23andME , and AncestryDNA. . Each company uses a different criteria for determining a DNA match. "FamilyTreeDNA and 23andME are the only testing companies that offer a chromosome browser. This is a tool that allows test-takers to see exactly what segments of DNA they are identified as sharing with another person." Many questions having to do with what the word "matches" means can be found in this chapter. 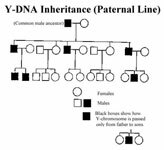 In this chapter you will learn what X-DNA is and how it can be used to identify common ancestry with your genetic matches. Of course this means you will need to have researched your family tree so you can make the comparison. The "Core Concepts" of this chapter are a must read. See page 136. Part Three. Analyzing and Applying Test Results. This chapter is helpful because third party tools can sometimes help you to find genetic cousins that tested with another company. Bettinger does a great job of describing the offerings of several of these companies. On the last page of this chapter is a checklist of things to do to get ready to try a third party tool. See page 152: "Getting Started with Third-Party Programs Checklist"
"An ethnicity estimate represents which portions and how much of a test-taker's DNA match one or more reference populations around the world." "Ethnicity estimates work best only for determining the continental source of DNA." "Y-DNA and mtDNA are both very useful for examining complex genealogical questions, as long as the limitations of those DNA tests are carefully considered." The book "The Family Tree Guide to DNA Testing and Genetic Genealogy" by Blaine T. Bettinger is well organized and probably the best reference book for understanding DNA testing and how to use it to confirm your researched family lines. An excellent addition to your genealogy reference library. Copyright © 2017-2018 Cindy Carman All rights reserved. No reproduction of this article may be used without the express written permission of the author.